Garden City - Crews with the Ada County Highway District repaired more than 200 potholes last week and early this week. A total of 208 potholes across Ada County have been patched, many of which were brought to the agency's attention during the annual Pothole Days event. Every year ACHD runs this event to encourage the public to report potholes when they see them. 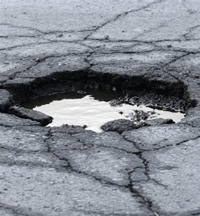 The event ran April 2nd through April 4th; however, potholes can be reported anytime.